Newsletter March 30, 2016 – Volume 20, Issue 4 Download PDF Newsletter-201603 In this issue: 1st Vice President’s Message, Items to Note, April Events, Thrift Store Items, 85 Years of Service, Melvin Jones Fellows, Eyes on the Web, Junk Day, Auction Recap & Photos, Queen of Hearts, Thanks to Our Sponsor. Newsletter February 29, 2016 – Volume 20, Issue 3 Download PDF Newsletter-201602 In this issue: 1st Vice President’s Message, Cambodia Bike Project, Lions State Convention, Help with Charity Auction, Eyes on the Web, Lions Pride Math Challenge, District 33S 3rd Advisor Meeting, Queen of Hearts, Thanks to Our Sponsor. Newsletter January 22, 2016 – Volume 20, Issue 2 Download PDF Newsletter-201601 In this issue: 1st Vice President’s Message, Eye Mobile Test Results, Cookout for Seniors, Reindog Parade Winners, Holiday Festival Report, Cambodia Project Photos, Golf Tournament Report, Upcoming Events, Queen of Hearts, Thanks to Our Sponsor. 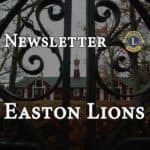 Newsletter September 9, 2015 – Volume 20, Issue 1 Download PDF Newsletter-201509 In this issue: President’s Message, The Demoiselle Crane, Special Election of Officers, Canal Walk, Lions Hearing Foundation, Queen of Hearts, Thanks to Our Sponsor. 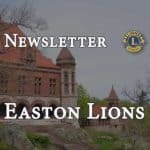 Newsletter July 1, 2015 – Volume 19, Issue 10 Download PDF Newsletter-201507 In this issue: President’s Message, Follicle Fundraising, Easton Wings of Hope, Eyes on the Web, A Day at the ‘Thrift’, Peace Poster Winners, Youth Speech Contest, Queen of Hearts, Thanks to Our Sponsor. Newsletter May 20, 2015 – Volume 19, Issue 9 Download PDF Newsletter-201505 In this issue: President’s Message, Spread Thrift Store Fame, Melvin Jones Fellows, 2015 Scholarship Awards, Administrative Budget Scalping, Eyes on the Web – Calendar, Queen of Hearts, Thanks to Our Sponsor. Newsletter April 23, 2015 – Volume 19, Issue 8 Download PDF Newsletter-201504 In this issue: President’s Message, 2 Newsletter Sponsors Needed, Giving One for the Gipper, New Member Orientation, 2015-2016 Officers, Remember Junk Day, Queen of Hearts, Thanks to Our Sponsor. Newsletter March 27, 2015 – Volume 19, Issue 7 Download PDF Newsletter-201503 In this issue: President’s Message, Recognition Night, Thrift Store Helps Family, Club Purchases Reminder, Auction Wrap Up, Spring Cleaning, Junk Day April 25, Cabinet Advisory Meeting, Eyes on the Web, Queen of Hearts, Thanks to Our Sponsor. Newsletter February 19, 2015 – Volume 19, Issue 6 Download PDF Newsletter-201502 In this issue: President’s Message, Recognition Night, Mass Eye & Ear Bus Trip, Auction Update, Eyes on the Web, Queen of Hearts, Thanks to Our Sponsor. Newsletter January 8, 2015 – Volume 19, Issue 5 Download PDF Newsletter-201501 In this issue: President’s Message, Recognition Night, Bourne’s Auto Donates Car, Holiday Event Photos, New Member Orientation, Eyes on the Web, Queen of Hearts, Thanks to Our Sponsor.